Busy day here today! Yesterday I spent a few hours cleaning cages and moving mantids and ooths to bigger cages for molting, hatching, etc. 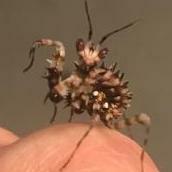 I'm so glad I did all that yesterday, because I had one of the ooths (G. amoena) hatch out today (2 nymphs so far). One of the ghosts molted to subadult! She is so pretty! (Pictures coming) I also fed my green anoles and finally got the picky eater to eat a mealworm. Iris and ButterRum-Verde has a little altercation this morning. Put them on the same plant and Iris felt threatened. They sized each other up for a little. Iris even almost opened her wings. I have to remember that ghosts are semi communal! It was interesting to see this behaviour though! Watching a mantis with wings display vs. a mantis without wings. Can't wait till tomorrow! I am going to the Philly Insectarium with a friend of mine. Utah has become an adult! She molted overnight last night and is on the lid of her enclosure, hanging and generally looking beautiful. I will take photos later at feeding/care time. I also have pics of Gustav, I just didn't get them on Photobucket as yet. Just came from work and Mocha is in the middle of molting!! The first ghost molting I've witnessed! She's beautiful! Many of my remaining BSFL are very small. So, I figured i'd add something to eat. Wow. Just a few hours and they're well into this slice of cucumber! Another good morning in the Mantis household! ButterRum-Verde is on the verge of a molt! Iris and Mocha took down a dubia today and they were on the bigger side. Although she has one arm, Iris is still very fierce! 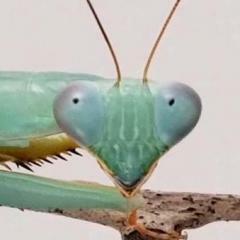 Love my mantids! Happy Friday everyone! Gustav finally molted to adult last night. Came home from work to find him with wings. It's about time! Now, if only Arthur would take a cue from his brother 😊 Utah is still hanging and looking molty, so she will hopefully molt today. I also have a female orchid who is about to molt to subadult, and is looking ready to molt any second. Hopefully, she will molt tonight, too. It was a good morning in the mantis household! Iris ate her first real meal after molting which was a good sized dubia! She is a one armed wonder!😊 ButterRum-Verde also had a roach which I was surprised about. Her wings are in the prepuff stage and I guess only the mantis keepers of a long time would understand that idea, but I'm trying to fatten her up before she stops eating! Mocha demolished two flies today and it was so impressive! Haha! Love them!